WARNING: There's some talk about sexual assault in this conversation. Nothing graphic, just some discussion of the use of it in comedy, in the abstract. If you're sensitive to these kinds of topics, we figured we'd give you a heads up. Jon Iver Helgaker and Jonas Torgersen join us to discuss their hit Norwegian show Norsemen. It's a sitcom about vikings. It has a particularly Norwegian sense of comedy. Deadpan but brutal. It's set around the year 790 AD. Throughout the series we see the villagers and vikings deal with daily life. The vikings pillage. The vikings fight amongst themselves. They sacrifice slaves. The jokes are great. Sometimes it's straight-faced like The Office, sometimes they play it big and absurd like Monty Python. Except, the violence is real, and their actions have real consequences to the storyline. And at the heart of the show, modernity is closing in on them. New inventions. New norms. Pillaging towns doesn't pay like it used to. they'll explain Taco Friday: the latest food craze in Norway. 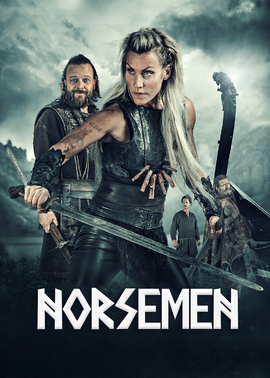 The first two seasons of Norsemen are available to stream on Netflix now.